Restaurants, similar to other businesses regularly, give out coupons to customers. It is a good marketing tool similar to posters, flyers, and billboards, which have been shown to be very effective. They easily attract the attention of customers while making them come back to the restaurant not only for the food but also for the restaurant’s promotions. If you are planning to use some coupons for increased visibility and sales for your restaurant, check out the attractive yet affordable restaurant coupons we have featured in this article. Why give out restaurant coupons? Restaurant coupons are effective marketing tools to use in your restaurant. They can also be classified as gift certificates and vouchers. 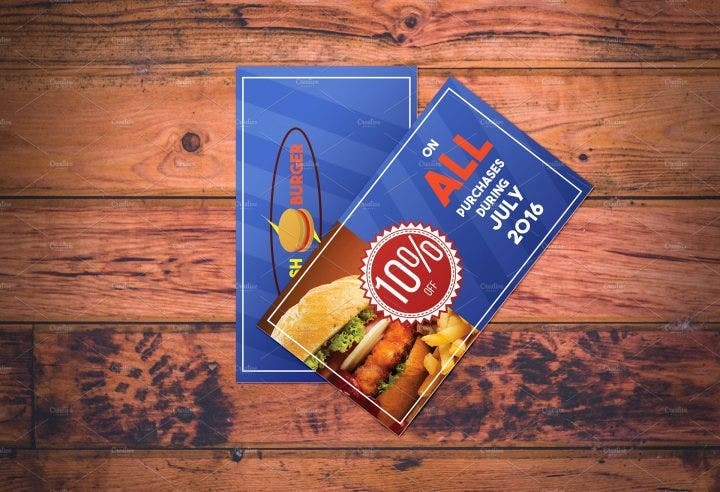 The difference between flyers or posters and coupons is that the former are given to potential customers or people who haven’t visited the restaurant yet. The latter, meanwhile, are given to customers who are already eating in the restaurant and all you need to do is make sure they come back. The great thing about restaurant coupons is that they can have any value. Restaurants don’t need to have the same coupon discounts since not all restaurants have the same size (number of employees, guests they can accommodate, equipment, etc.) and financial capability. Bigger or more popular restaurants offering 30 to 50% discounts to their customers on their next visit may not be the ideal model to emulate for smaller restaurants. These small-scale restaurants may offer other value in the coupons such as giving away free souvenirs (mugs, calendars, restaurant themed stickers, etc.) or offering a lower discount to customers on their next visit. Restaurant coupons also can’t be used the day the customers eat at the restaurant. This is a marketing strategy which doesn’t make the customer’s trip to the restaurant a one-time affair. Customers need to return to use their restaurant coupons. 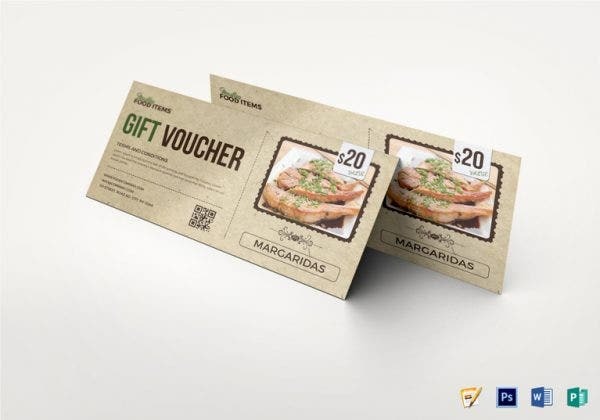 Restaurants may also use this opportunity to give another set of coupons to customers after their return visit to increase the possibilities of customers coming back even more. 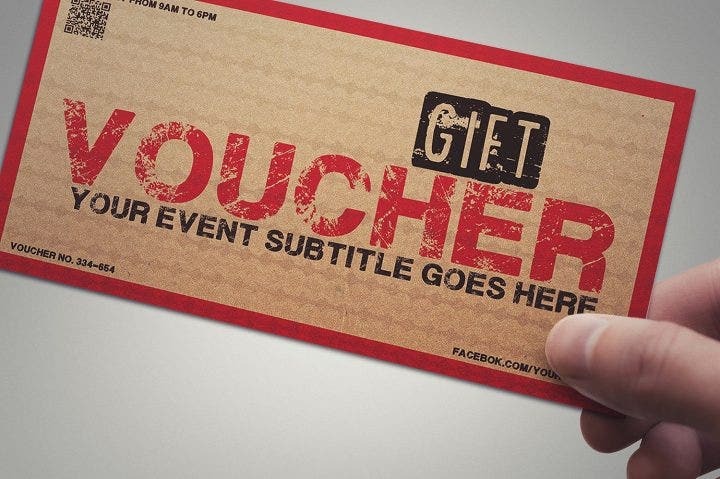 Giving out restaurant coupons may be a bit costly on the restaurant’s end, but it’s all part of advertising or marketing which all businesses need to spend for. The long-term effects of marketing outweigh its costs, and it will definitely help the restaurant’s sustainability. Use this food coupon template for your own restaurant. This template has a brown backdrop and a space where you can insert both text and an image of your dish. 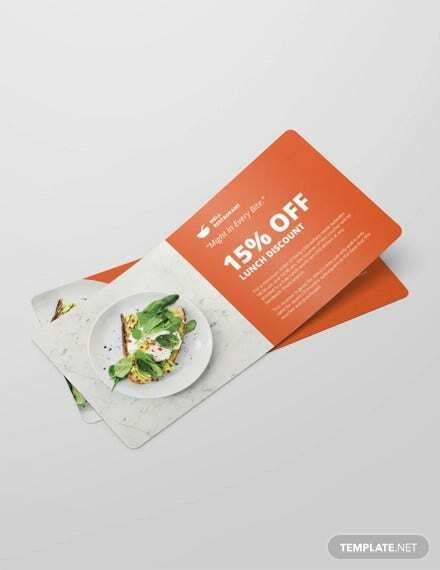 This beautifully designed restaurant coupon template should be a top priority when looking for an attractive coupon design for your restaurant. Planning to serve all-day breakfast which includes eggs, bread, pancakes, bacon, and hotdogs? 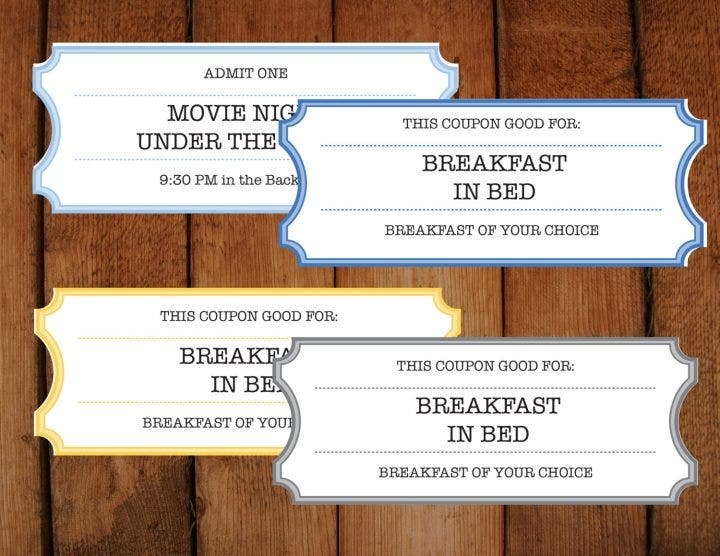 Try this “breakfast in bed” coupon and hand them out to your loyal customers who just can’t seem to get enough of pancakes and eggs in the morning. Bed and breakfast restaurants have been gaining popularity the past few years due to their concept, so if you own or you plan to open a bed and breakfast, don’t forget to purchase this coupon template. This editable restaurant coupon template lets you choose between six colors (red, yellow, green, blue, pink, and black). Choose the best color for your restaurant or purchase multiple colors and see which color best fits your restaurant. Edit the text to fit the coupon value for your own restaurant. If the space still permits, you can add an image of your dish in the background. 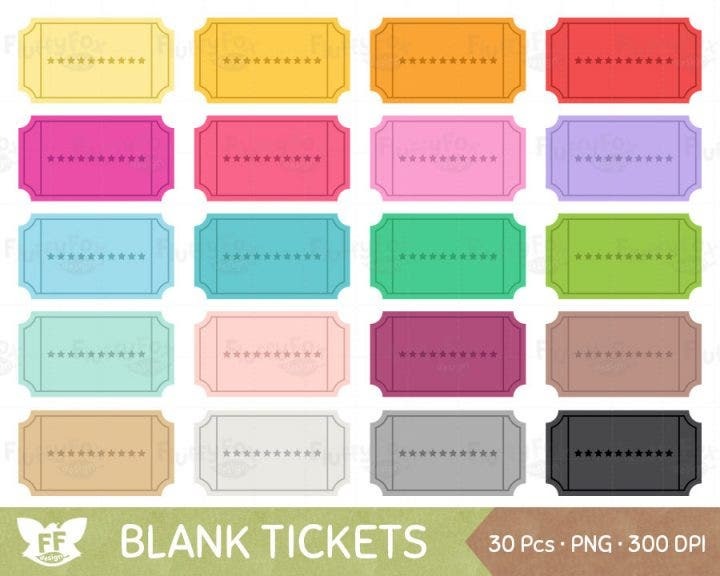 Here is another colorful ticket coupon that uses a raffle ticket template. Available in 20 colors, use this unique raffle ticket coupon for any kind of restaurant. Although the template is best used for casual restaurants due to its color and design, it can definitely be used for formal restaurants. Despite its small size, you can still insert the important text and details although it will be difficult to add images. 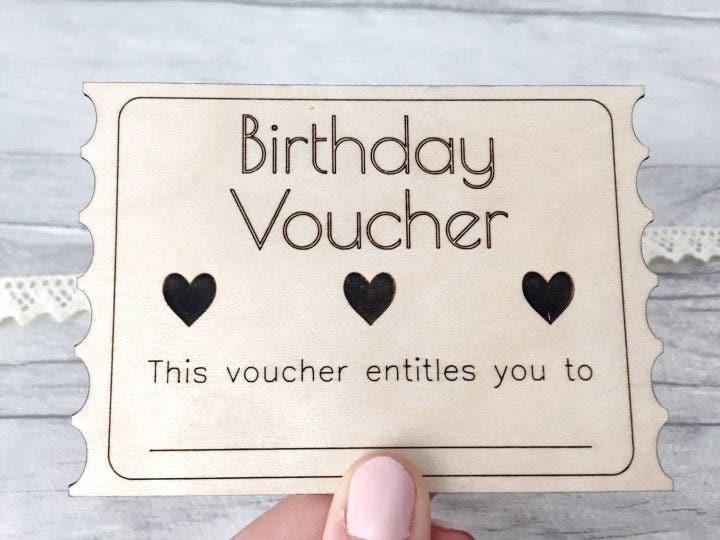 Give this birthday voucher to your customers celebrating their special birthday in your restaurant. Giving away special gifts aside from a cake and a set of balloons to your customers will make their birthdays extra special and will definitely add some necessary promotional boost to your restaurant. Each birthday celebrant given a coupon will definitely encourage more customers to celebrate their birthdays in your restaurant. Celebrate Valentine’s Day in your restaurant with this beautiful love coupon. 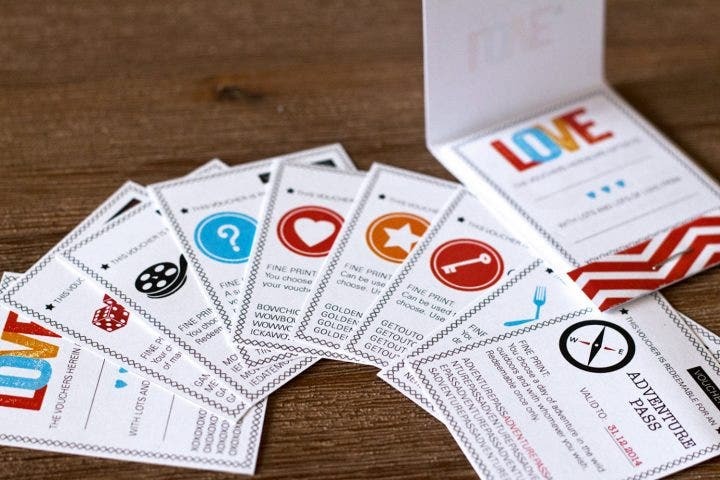 Hand these out your married customers, dating customers, and even your single customers and let them enjoy Valentine’s Day in your restaurant. You can edit the text in this template to fit your restaurant’s event. 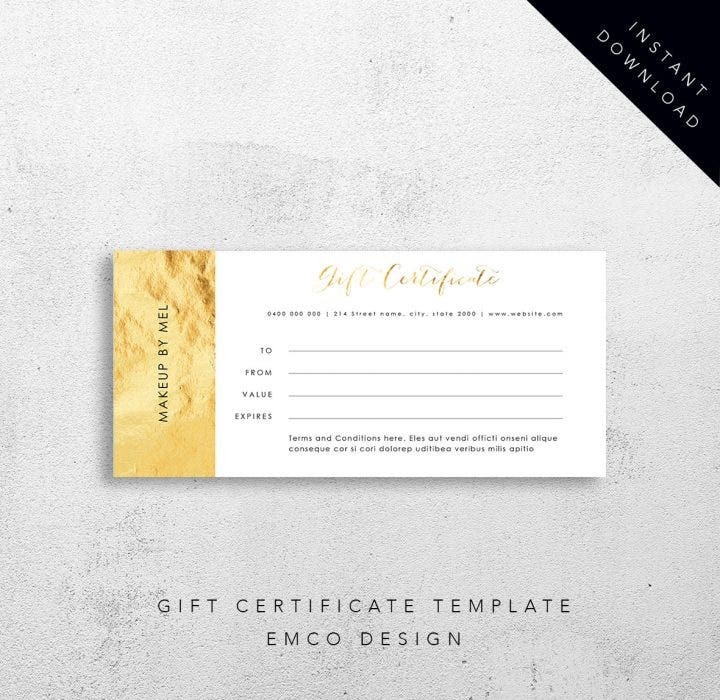 This gold gift certificate template can also be used for your restaurant. The gold color fits a more formal restaurant, but it can be used for a casual restaurant as well (although this template does not fit a fast food chain). The gold border on the left-hand side of the template provides the main attraction of this design. The text is fully editable on this template to fit your restaurant and any discount or promotion you are offering. Planning to give out some thirst-quenching drinks to your customers? Use this drink voucher if you are offering some free drinks or drink discounts in your restaurant. This is best used for sports bars where alcoholic drinks are served more than food. This provides an opportunity for you to turn casuals into regulars. 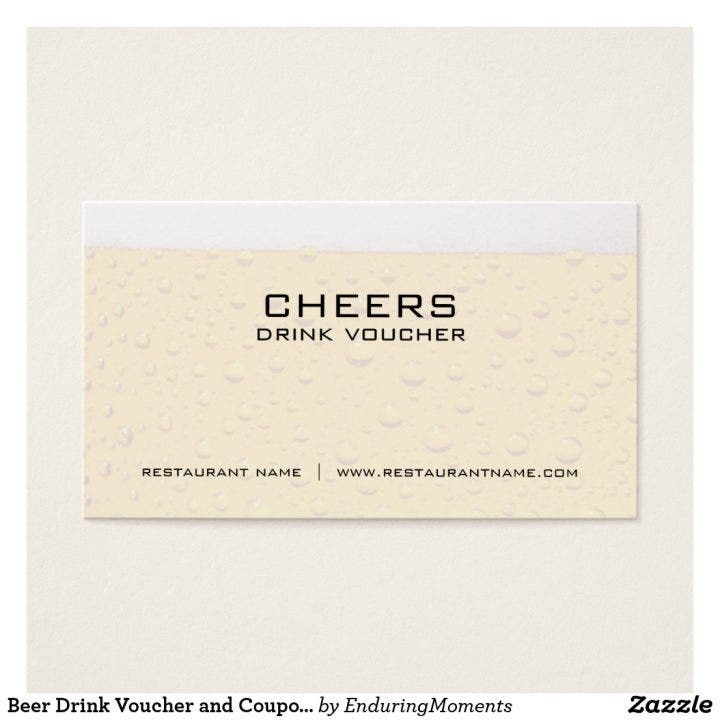 Drinks sell faster than food, so take advantage of this drink voucher template. This template looks like it came out of 1980’s Madonna’s wardrobe. 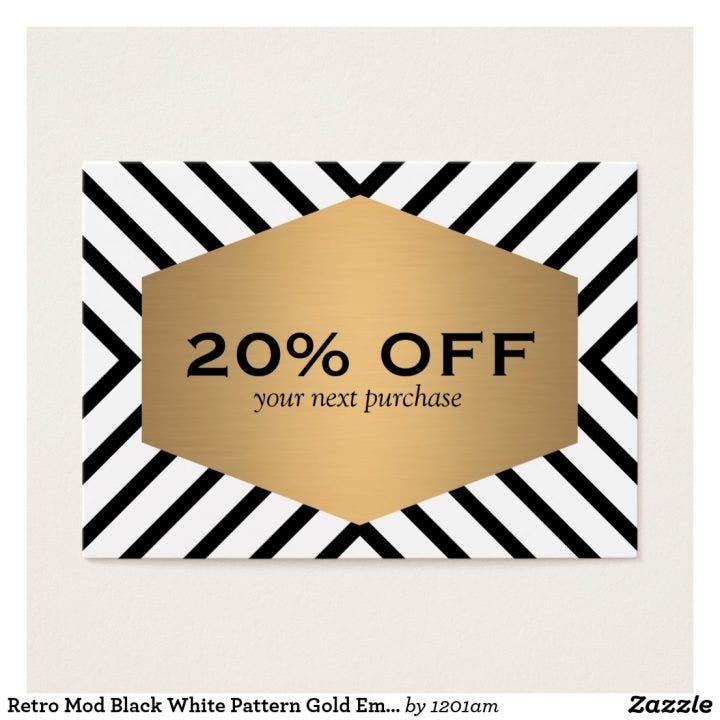 The black and white stripes complement the gold area in the template where you enter the text. Use this coupon if you are using a vintage theme or hosting decade night in your restaurant. Here is another drink coupon for your bar/restaurant. 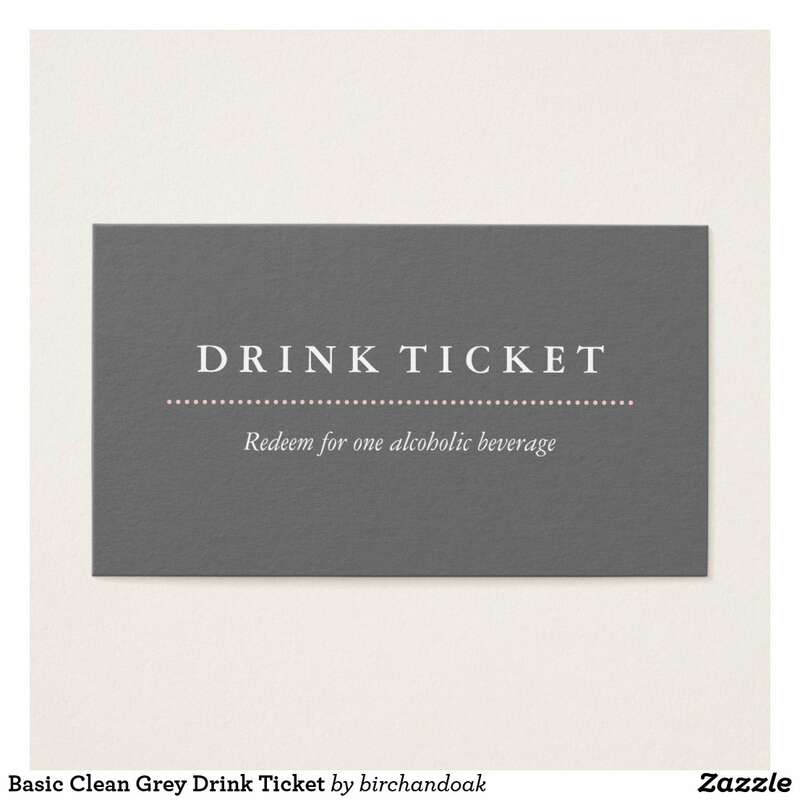 Compared to the other drink coupon, this template uses a simple gray color. 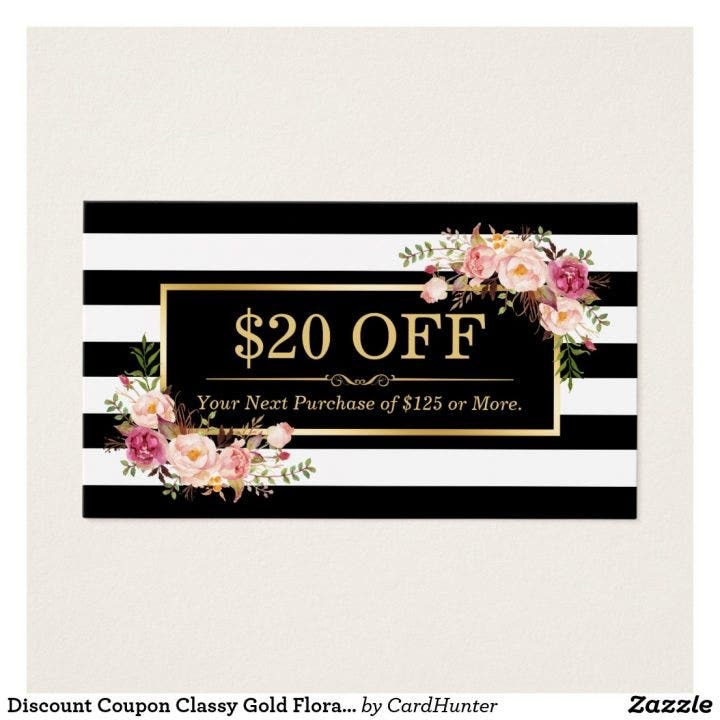 The simplicity in this coupon makes it attractive. The text is given more importance and easily sends the message across to the coupon recipient. Edit this business card to fit your own restaurant, specifically for the restaurant coupon. Edit the text and insert the details of the discount or promotion you are offering. Similar to the other template, this template also uses a black-and-white pattern resembling a vintage 1980s style. Use this red vintage voucher for your grill restaurants. The grungy 1990s style used for the text perfectly fits grill restaurants serving some mouthwatering rib-eye, loin roast, and belly. Here is another coupon resembling a raffle ticket design. The size is quite small but you can still add all the necessary details in this coupon template similar to the raffle tickets above. This coupon is the best coupon template you can use for your fast food restaurant. All files are editable. There are spaces allocated for text and images where you can insert them accordingly. Is your restaurant serving some quality brew coffee or some sweet tasty desserts? Or are you just planning to give out coffee and desserts to your customers at a discounted price? Then this coffee discount coupon is the perfect template for you. 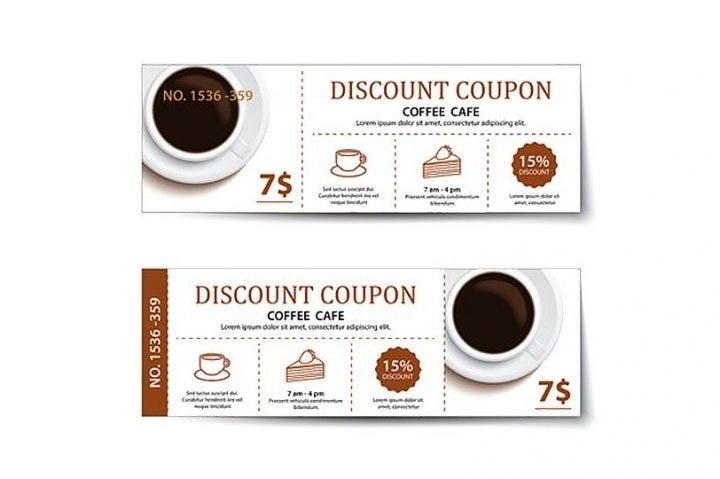 This template contains an image of a cup of coffee together with the discounts the customer can avail. The brown hue matches the template’s color. Restaurant coupon templates don’t need to have extravagant designs as the text is more important for stating the details of the coupon. Look for simple yet attractive templates for your restaurant coupons. 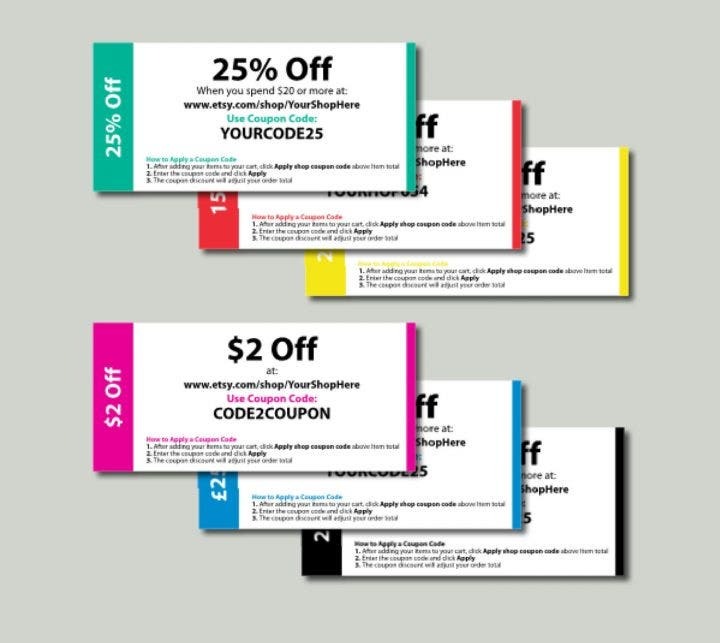 A single or double color scheme is preferred for coupons although you can still decide on the template’s final design. Using a minimalist design will make the text clear which is the coupon’s main concern. 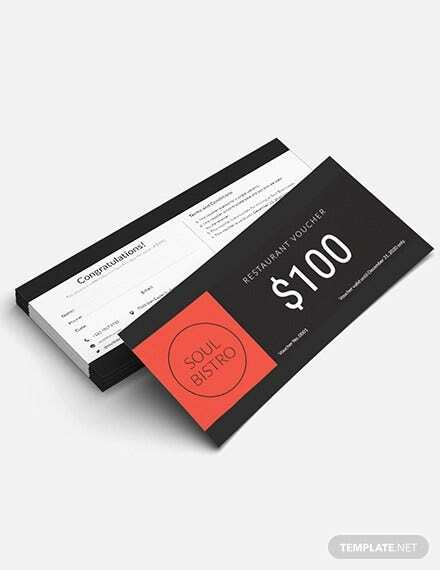 Despite using simple designs for the restaurant coupon, the final look should not be compromised. Already taking note of a minimalist or simple design, the template should still look attractive. 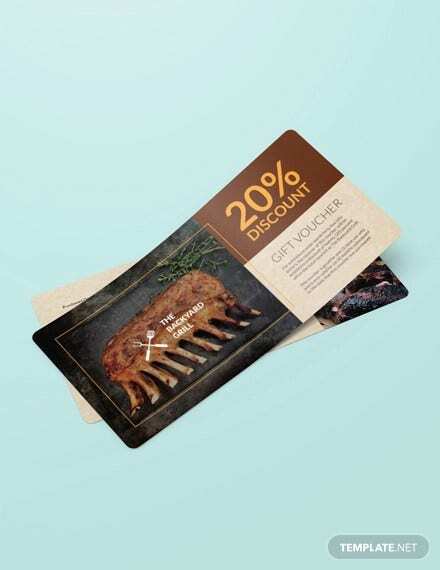 Customers will surely appreciate the effort made in the coupon and the coupon’s design will surely play a part in convincing the customers to eat again in the restaurant. Color adds aesthetic appeal to any design. Using mostly neutral colors like black and white makes the design dull. As mentioned above, the restaurant coupon plays a part in convincing the customers to return to the restaurant and use their coupon. A more colorful and beautifully detailed coupon will surely make your loyal customers think about making a return trip to your restaurant. There are various color schemes you can use for your own restaurant and it depends on your restaurant’s theme or concept. If your restaurant is serving Italian food, use the red and green combination as they are reflective of Italy’s national colors and these are also the colors mostly used in Italian restaurants. If you are serving Chinese food, use red and yellow as it also represents China’s national colors and the red color symbolizes luck and prosperity for the Chinese. Furthermore, you can also use a color scheme that matches the colors of your best selling food (for example: blue or green for seafood, red or black for grilled beef and pork dishes, yellow or red for dimsum, and green or yellow for salads). You need to be very careful when purchasing templates online. Although there are thousands of templates to choose from online graphic design shops like Best Templates, Zazzle, Creative Market, Stock Layouts, Graphic River, and Etsy, you need to consider a number of factors before clicking that purchase button. The last thing you want is to receive a poorly done and poorly edited design that you paid for using your hard-earned cash or credit card. Some factors you need to consider before you make the purchase is the designer’s previous works, the consistency in his designs, and the customer reviews. Check the designer’s previous works or other designs he is currently selling and make a judgment on their quality. One mediocre design over 20 quality designs certainly does not reflect the designer’s true level of skill. Additionally, while looking at his collection, don’t forget to check customer reviews. This is where you gauge if the purchase is worth it or move to the next template from another designer. The higher the designer’s rating, the better the chances you will get a good-looking design. 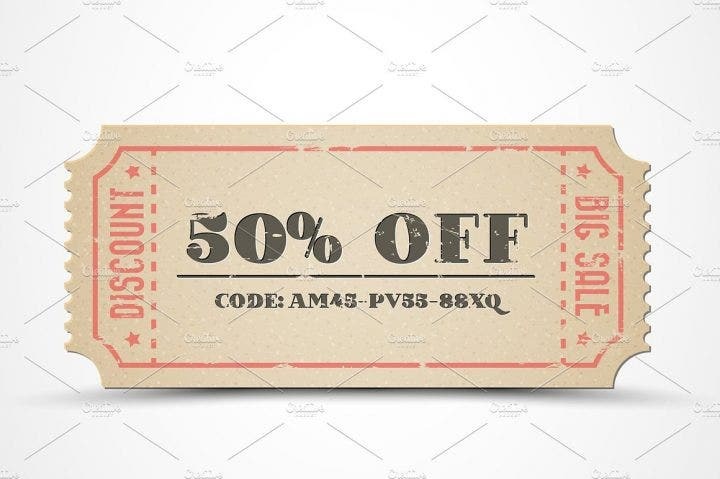 Since you are trying to convince your customers using restaurant coupons, the main details in the coupon (specifically the coupon’s value) are written clearly. Small font styles and blurred text that are barely readable will cause confusion among your customers and make them decide to skip your restaurant entirely. Advertising a discount or a free meal in the restaurant coupon should be the first thing that the customers lay their eyes on which signifies the whole purpose of the coupon. So there you go; some beautiful restaurant coupon templates and some tips on how to properly use them. We hope you enjoyed browsing through our collection. Make your purchase now!